Arsene Wenger, as he liked to do as Gunners manager, takes an interest and wanders over to have a look. Breaking off his first-team duties, he spends 20 minutes studying, analysing, assessing. This is the part of the job he loves the most. Eventually he walks away. His conclusion? 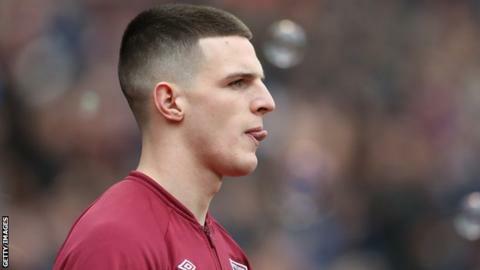 Hammers central defender Declan Rice is the best player on the pitch. Considering Rice is just 16 and the game comes 19 months after the crushing disappointment of his release by Chelsea, it says much for the youngster's mental strength that he not only recovered but worked on the weaker areas of his game to such an extent that he excelled against an older Arsenal side who would go on to reach the FA Youth Cup semi-finals that year. But then, having absorbed the thoughts of a couple of people who have worked closely with Rice during his development from hopeful junior to the England squad, such fortitude should not come as a surprise. Rice joined Chelsea as an eight-year-old. He was 14 when he was released, his only comfort coming in a 45-minute phone call from a reassuring John Terry. The following day he had a trial at Fulham, whose training ground was three miles from his house in Kingston-upon-Thames. The day after that, he had one at West Ham, 26 miles away. Then, as now, with the international switch from Republic of Ireland to England, no-one could accuse Rice of taking the easy option. And even after his move to West Ham, his career path has not been straightforward. In his year group, Rice was the only player given a scholarship who was not offered a guaranteed professional deal at the same time. According to the Hammers' Under-23 coach Steve Potts, the reaction was impressive. "It's a very difficult age for a young player to be rejected," he says. "They feel they are on the verge of starting a career in the game. Many don't recover. "Declan just got his head down, fought for everything and forged his own path. He has continued improving ever since, and is still improving now." That Arsenal game came at the start of Rice's debut campaign for the West Ham Under-18 team. Potts, seventh in the Hammers' all-time appearance list with 506, was his coach. He quickly realised he had a player determined to make it to the top. "In that first year, I remember him having one bad game, which probably only stands out because it was a surprise. I can honestly say he hardly put a foot wrong," he says. "Whatever people say about coaching or development, deep down it has got to come from within. "Every player who comes into the academy has got ability and talent - and they get advice and guidance to help their development. Some take it on board, some don't. Declan has always listened and learned very quickly. His progress is 95% down to his own self-motivation and desire." It was during his time with the Hammers' Under-18s that the decision was taken to move Rice forward, up from centre-back into the defensive midfield role where he has excelled in the Premier League this season. It is here that he has also come to the attention of England manager Gareth Southgate, who last week named him in his squad for this month's Euro 2020 qualifiers against the Czech Republic and Montenegro. Former England defender Matthew Upson was Rice's mentor at West Ham and although the transition has brought rewards sooner than most predicted, he could always see why it would work. "The midfield role suited his skill set more," Upson says. "He reads things very well, takes up good early positions and fills spaces. His positional decision-making is very mature and seems to come naturally to him. He keeps it simple with the ball. He passes it early with good pace and tries to be progressive when he can. "He is brave in the tackle and has really worked hard on the basics." Rice was 18 when he made his first-team debut. He played in 31 out of West Ham's 45 games last season and 32 out of 36 so far this term. Upson quickly detected impressive leadership qualities. "He was organising players on the pitch in his first 20 games," he says. "He worked on his body language, to make sure he is transmitting positive messages to people around him." Listening to Upson, it is quite easy to conjure up an image of West Ham legend and England's World Cup-winning captain Bobby Moore. Indeed, by Rice's age of 20 years and two months, Moore had played a similar number of first-team games. Even this season, though, there was a setback. And once again Rice's reaction was key. "Declan played in the opening league game at Liverpool [which West Ham lost 4-0] and then was left out of the first team," Potts says. "He had every right to be disappointed at coming back to the Under-23s and not being at his best in training. But he was the exact opposite. He led the way, trained as hard as he could, and got himself back in." Now Rice is facing his next challenge. Evidently, he was not courted by Southgate in order to be ignored. Equally, Rice has not turned his back on the guarantee of regular international football with the Republic of Ireland to watch from the sidelines. He wants to make an impact. Even in his very first England training session, he was doing just that. Moving in close in his unfussy way, seizing possession from Eric Dier before laying it off. Upson is convinced the future for Rice is very bright indeed. "It's not often you get the right mixture between confidence and humility," he says. "Declan doesn't doubt himself. But he's also open-minded and open to criticism. He takes on little bits of detail and adapts them into areas of his game that aren't going right. He reacts to harsh truths and high praise in exactly the same way. "It's about his journey, how he manages it, the people he surrounds himself with. That is a challenge, as it is for any young player. But having seen him for the past two years, he seems to have the personality and character to manage that. "Nothing is a given, but he is in a great position." Rice, pictured here in 2017, signed his first professional contract with West Ham in 2015. He said at the time: "The best part of my game is my communication. I see myself as a leader."